Today’s post is not for the squeamish or faint of heart. I find the scientific research into decomposition fascinating. I originally posted this article more than a year ago and have received so many comments and questions about it, so I thought I’d repost again. The body farm refers to a research facility where human decomposition is studied in different settings, conditions, and environments. The invaluable research gains a more accurate understanding of the human decomposition process. 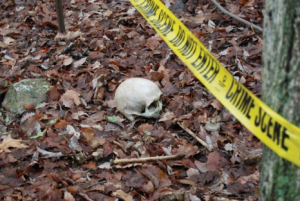 As ghoulish as it sounds, learning to properly develop techniques to extract information from decomposition remains, such as the time and circumstances of death, prepares investigators, law enforcement and forensic anthropologists to pinpoint and reconstruct the chain of events of a crime.